Why should I exercise? It's a great question, with a lot of great answers, all based upon your personal goals. However I think there are at least 7 really good reasons to start an exercise program. Not to mention that Summer has arrived and it's beach weather. A time of year when we all want to look and feel our best. A regular exercise program is a great way to alleviate chronic muscle and joint pain. Persistent back pain for example can be reduced by strengthening your core. It will also help to protect yourself against injury. My clients are amazed when the chronic pain that they’ve lived with for years begins to fade after starting a regular exercise program. More muscle is a good thing for many reasons. One of the most important reasons is muscle requires many more calories each day than fatty tissue. In fact, one pound of muscle burns 30-50 calories each day at rest, compared to 9 calories per pound for fat. Simply said muscle mass burns more calories per day than fat. When you exercise your body composition will change to contain more lean muscle mass, thus resulting in extra calories burned while you sleep. How about that, you're burning calories even when you sleep. Is it worth the effort? Tim D. Spector, a professor of genetic epidemiology at King's College in London, led a study on the effects of exercise on aging. The results were astounding. This study found that exercise appears to slow the shriveling of the protective tips on bundles of genes inside cells (called telomeres), which means a slowing of the aging process. "These data suggest that the act of exercising may actually protect the body against the aging process," said Spector. Telomeres cap the ends of chromosomes and every time a cell divides, the telomeres get shorter. Once a telomere gets too short, that cell can no longer divide. Aging occurs as more and more cells reach the end of their telomeres and die. This results in weakened muscles, skin wrinkles, loss of eyesight and hearing, organ failure and slowed mental function. The study analyzed the telomeres from the white bloods cells of twins over a 10-year period. Telomere length was used as a marker for the rate of biological aging. It was found that the length of telomeres was directly related to that twin's activity level. "There was a gradient," Spector said. "As the amount of exercise increased, the telomere length increased." The studies conclusion was that people who did 100 minutes of weekly exercise had telomeres that looked like those from someone about 5-6 years younger than those who did 16 minutes of exercise each week. People who did 3 hours of vigorous exercise each week had telomeres that looked like those from someone about 9 years younger. Pretty impressive, and another great reason to exercise no matter your age. Type 2 Diabetes is on the rise around the country. It has been found that exercise helps to stabilize blood sugar levels. As a result people with type 2 diabetes, or who are at risk for type 2 diabetes, gain substantial benefits from a regular exercise program. Exercise improves the body's use of insulin, and the related weight loss improves insulin sensitivity. Of course patients with type 2 diabetes need to get guidelines from their doctor before starting any exercise program. However a program approved by your physician will help you reduce the risks of Type 2 Diabetes. Exercise has shown to lower blood pressure and cholesterol levels. It does this for two basic reasons: First Weak Heart Muscles pump little blood with lots of effort. By exercising you strengthen your heart muscles and train them to pump more blood with less effort. The stronger your heart is the less pressure will be exerted on your arteries. Second Exercise Increases HDL (good cholesterol) levels in some people, this means a decrease in your risk for heart disease. Other heart disease risk factors such as weight, diabetes and high blood pressure all show improvement with regular exercise. The first thing that clients tell me after starting an exercise program is how much better they feel. Most didn't even realize how bad they felt. It is easy to get used to feeling sluggish, achy and unmotivated. Exercise boosts your energy levels and makes you feel great. So there you have it, my seven reasons to start a Regular Exercise Program. If you don't have one start one today. The easiest way to guarantee that you'll meet your fitness and weight loss goals is to exercise with a partner or with a personal trainer. Your partner or personal trainer will help to hold you accountable in your workouts and this will help to expedite your results. Whatever your reason is for exercising is, start today. Remind yourself why you started down this road. Write it down and place it where you will see it everyday. It may be just the motivation that you need. Good luck and if you need help or have any questions, feel free to contact me at any time. I'm happy to help. Do you like pie? 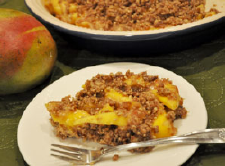 I do, and recently I found this Mango Pie recipe that I think you will like. You won't find any processed sugars or refined carbs in this dessert; just sweet and nutritious whole food ingredients. Remember to use portion control even with healthy nutritious desserts. Combine the pecans, 1/4 teaspoon of the vanilla bean, sea salt and 3/4 cup of the dates in a food processor. Press half of the mixture into the bottom of a pie pan, set aside. Combine the remaining 3/4 cup dates, 1/4 teaspoon vanilla bean and water in a food processor or blender. Mix until a thick syrup forms. Place the mangoes in a large mixing bowl. Toss with the syrup until fully combined. Arranged the mangoes over the crust, then sprinkle with the remaining crust. Keep in the fridge and eat within 2 days. Nutritional Per Serving: One serving equals: 220 calories 12g fat, 27g carbohydrate, 5g fiber, and 3g protein.